We are delighted to announce that Oakdene Care Home has picked up another award at the LPZ Awards which were held on 5th February 2019 at Trent Vineyard in Nottingham. 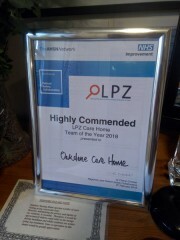 This year we were awarded the Highly Commended Team of the Year for 2018. You can see the award currently on display in our foyer.